Globe just announced the prepaid and postpaid pricing of Samsung Galaxy Note 3, you can now go to your nearest Globe business center or inquire to their agents about this plan. Get this free at Plan 1799 with unli LTE surfing for 24 months lock in period. Pay for 999+800 pesos as your monthly cash out making it P1799 per month using credit card. You’ll also get network services with your consumable for this plan that you can use for text, call and surf. 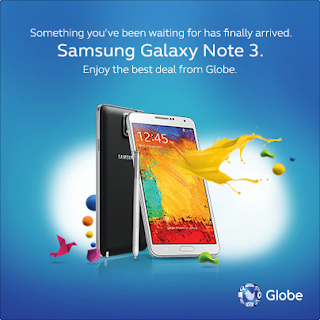 You can compare Globe Samsung Galaxy Note 3 plan pricing to Smart Postpaid offers. Tell us which pricing give you savings by hitting the comment box below. To apply for this plan you can visit Globe Business Center or call their hotline if you have something to clarify about this offer.